Spotted dogs have been found on murals in the Egyptian pyramids. They take their name from an extinct land now in modern day Croatia and are thought to been developed from the Pointer or Hound. Despite this uncertain history it is widely believed that the Dalmatian was originally used for hunting. In the United Kingdom the Dalmatians’ most prominent working role was one of the carriage dog. A Dalmatian was an integral part of the carriage makeup as essential as the horses. They were considered not only a fashion accessory but also, their numbers and distinctive spotted coats were a direct indication of their master’s influence and wealth. They were primarily used to guard the horses and would usually sleep in the stables with the horses at night. This explains the Dalmatian’s need for copious amounts of exercise when a healthy adult and their natural affinity with horses. In modern times the Dalmatian has developed in to a much-loved pet, companion and show dog. Our breed is often used in adverts and marketing due to their distinctive appearance and of course we are all familiar with Dalmatians on the Silver Screen. There are even some Dalmatians who are successful at obedience, agility, flyball and carriage trials. The Dalmatian is an active dog, full of energy and make great companions. There is nothing a Dalmatian enjoys more than to be with you, this means everywhere, even the Loo!! They are not full time outdoor dogs they do not possess the adequate coat for the British Weather, nor should they be left for long periods alone in the house during the day. Dalmatians come in two colours: White with Black spots, & White with Liver spots. This distinctive appearance is one of the main attractions of this breed, but prospective owners are advised to find out as much information about the characteristics of the Dalmatian. It may be a good idea to have spent some time with an adult Dalmatian, as this breed is not the perfect choice for everyone. The Dalmatian is happiest in a home where there is someone in during the day and also families who are active, enjoy the outdoors and are prepared to give our lovely breed all the exercise he or she needs. New owners should be aware that Dalmatian hairs do not stay exclusively on your Dalmatian; they have a habit of getting everywhere and shed year-round. So if you are very house-proud and worry about pristine carpets or your lovely new black outfit, then maybe a Dalmatian isn’t for you? It will become easy to ‘spot’ a fellow Dalmatian owner and we all accept each other’s attire complete with hairs with a smile! Dalmatians are quite large dogs, with ‘whippy’ tails and are full of energy and exuberance. They certainly benefit from obedience training and can reward your efforts with a nicely behaved, loyal pet, if you are prepared to put in the time and patience that Dalmatians’ need. If all of this sounds daunting, if you can give a Dalmatian all he or she requires, they will reward you with years of delightful companionship, loyalty, laughter and sometimes complete infuriation but they are guaranteed to turn your lives decidedly dotty!! The above information is a guide all dogs are individuals and most dogs will exhibit some, all or maybe even none of the typical Dalmatian characteristics. If you would like advice or information about Dalmatians please take a look at the British Dalmatian Club website where you will be able to find a variety of resources. 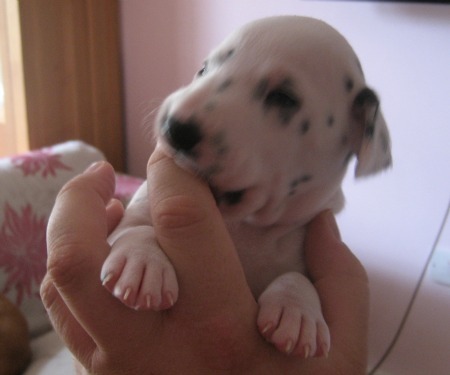 There is an online forum that you can join, chat and share experiences with other Dalmatian owners. If you would like to talk to someone in person please give our central coordinator a call (07905) 495084 and we will call you back.